Dudu’s Dive! Was it?? Wasn’t it? Who cares!! I’m a little angry this morning with all the negativity surrounding the club and our assassin with regards to the ‘dive’ incident that occurred against a well beaten Celtic in Europe. The game finished on Wednesday, its now Friday and we are still hearing the same old stories that we are cheats and Dudu should be banned. In my opinion its over exaggerated and totally biased. It takes the gloss away from a crushing performance against a side that apparently would make the top four in the PL (at who’s expense).So I thought I’d jump to the defence of our Crozillian. OK. I don’t think it was a foul, therefore I don’t think it was a pen, but the opportunity was there to go over and that’s what Dudu did. In that type of situation, 8 times out of 10 the foul is given. What gets me the most is that at least he just fell. Gerrard does double back-flips…Ronaldo somersaults through the air and rolls half way across the pitch like hes just jumped out of a moving car. Drogba does pirouettes and gets more injuries from the grass burns than what he does from the ‘tackle’. Anyone would have thought these players had just been shot by a bazooka, hit by a high speed train and crushed by a falling meteorite the way they go down half the time and whats the response???? That’s football. The intent was there so it must be a foul. Well let me tell them that there was intent there with the Celtic goalie, Porridge. Like I said Dudu just fell. It wasn’t even a dive. There was minimum contact. The un-ironed crease in Porridges shirt brushed Dudus leg hair, Dudu was given a reason to go over and that’s just what he did. Any striker with natural striking instincts would do it. Dudu did it and we got the decision..Whats the response?? We are cheats!! Dudu should be banned. Poor Celtic. Are they having a laugh or what??? I firmly believe that they are just taking the piss because we trashed Celtic 5-1 over two legs when teams like Barca and their beloved Manure have struggled to do so…. It was a battle between an English team and a Scottish team, yet the English media have taken sides with Celtic not just after the results and the incidents but before the games too…. “Celtic were a threat”, “Celtic were unlucky”, “we were cheats”. For crying out loud Celtic had two shots on goal over two legs and they are trying to tell the world that they didn’t deserve to lose??? Get out of here. The tie had been won long before the penalty so I don’t agree it changed the game either. We were the better team and we deserved to win, we did win and would have won, penalty or no penalty so whats all the fuss about?? Next we’ll be hearing the stories the game should be replayed.. This attitude is totally against the norm as English teams are always supported by the English media in Europe, well they’ve made their agenda clearer than ever and I hope Dudu scores a hat trick of pens all from dives against Manure at the weekend because it couldn’t happen to a nicer team and it would piss the media off. We’ve been too nice over the last few years, suffering from the cheats and the dives and the offsides and the bad decisions, all in the big games at vital times. I still remember the Kuyt penalty two years ago, which was given and he dived. Then Hleb goes over and was fouled and it wasn’t given. We lost a game we should of won and we were cheated. That’s football right? Its about time we started giving some back and getting the decisions and I’m behind Dudu 120%. So there we were, 10 minutes to kick-off, excited and nervous at the prospect of either holding-on by the skin of our teeth or showing off big-time and proving that the Arsenal are back! Would our smooth silky skills and fast attacking football be enough to dump Villareal out of the Champions League and set up a meeting with either the Mancs or Porto? A trip to Porto in the spring is infinitely more enticing than Old Trafford – we have to go there anyway in May and this is the Champions League after all, where games should be against foreign opposition. In the week since Ade scored that wonder goal to give us the edge going into this tie, team selection has been causing us some consternation. Having lost Almunia, Gallas and Clichy from that game and then Djourou on Saturday, our solid back four has been shredded. Having said that, we haven’t conceded a goal at THOF since Plymouth on the 3rd January!!!!!!!!!!!!! Will Cesc play deep or high up the pitch and who will be his partner if we are playing 4-4-2? Theo and Nasri must be a shoe-in and so the final pieces are up front Ade and van Persie. As usual there was a surprise in store and this time its not Arsene messing around with the team selection – Sagna was out with a bug and fingers are crossed, Eboue would play at right-back…………..and what a treat that turned into! Theo and Eboue were passmasters supreme. They picked each other out at pace whilst totally controlling the right wing. Song was preferred to Denilson alongside Cesc in the middle and as the teams lined-up it was hard to take your eyes off Robert Pires gracing the Emirates turf – how he would have loved to have played another couple of seasons for us and how we would have loved him too. I expected us to come out of the traps really fast and Villareal obliged by giving us lots of space to play. We were quite relaxed. Adebayor had his trademark collection of off-side decisions in the opening minutes. Theo and Eboue easily beat their markers and it wasn’t long before a couple of good chances had come and gone. Were we going to rue the lack of finishing? Not for long. Theo floated a stunning ball over the top of the fast approaching goalkeeper that hung in the air for an eternity and nestled in the side of the goal. Fantastic we’d scored in the TENTH minute – dream come true. Adebayor was his usual very annoying self – lazy and off-side far too often, but it was written in the stars that he would score and he received a great ball from Van Persie with a deft first touch (unusual) and with his second touch he scored (made it look so easy). We were 2-0 up on the hour and his name was sung with gusto around the ground. Love him or hate him – if he keeps scoring, I can’t complain. I was worried that Song was running up blind alleys and giving the ball away cheaply but he grew in stature throughout the second half. Some of his ball play was stunning. He has skills tucked away that we can only hope that we’ll get to see more often. He dragged the ball back and twisted round, losing his marker in true Henry style. He may be the man to partner Cesc – I’d still rather an experienced DM but I’m prepared to let Song stake his claim on that position after tonight’s performance. Cesc tried a lot of passes that didn’t come off in this game but on another night he would have been hailed as genius. He could learn from watching how Pires worked the ball making neat intelligent passes rather than going for amazing every time. Not everything was working for Cesc but was he bovvered – I think he wasn’t. When Theo was brought down in the box and the linesman flagged for a foul Van Persie stepped up to put away a powerful penalty with clinical efficiency. 3-0 and twenty minutes still to go, with Villareal down to 10 men, unheard of for us to be cruising in this manner this season. We could just sit back and watch the football. The scoreline made it an easy decision to make substitutions. Denilson and Diaby came on for Theo and Van Persie with 15 minutes to go and then Nikki for Adebayor with 7 minutes to go. What I feel is really important is that this was not an awesome Arsenal performance – we won’t be reminiscing of the day Villareal came to the Emirates and we took them apart to book a place in a semi-final against the Mancs – this was an assured performance by a team that have the belief that they are really very good and that their exuberance, skill and intelligent play makes them frightening opposition. There are a possible 11 games left for us this season. 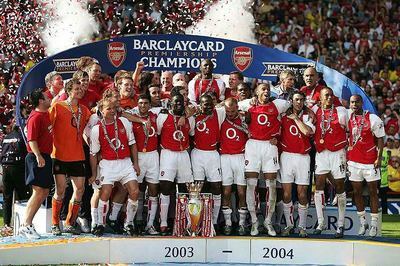 I hope our young, patched-up neo-invincibles go for glory and bring us back a cup or two……. they can be awesome. One thing that made last night special was the chance to thank Robert Pires for his years of fantastic service. We had two of the invincibles on the pitch last night and it was significant that Bobbie made a special fuss of Kolo. Most of the crowd stayed behind and applauded Pires off the pitch and you could see he reciprocated the emotion. Eboue 9 This is his position, please Arsene don’t play him anywhere else. His interplay with Theo in the first half was awesome. Toure 9 Dependable as always, intelligently didn’t go on any runs!!!!! Sylvestre 8 Did go on a couple of runs!!!!! Played well with Toure and his experience was important in the make-shift defence. Gibbs 8 Love him, he makes potent runs and has a good shot, left the back-door gaping a couple of times but hey, he’s young and part of the Peachesball revolution – We’re gonna score lots more than you!!! Theo 10 They’re my ratings and I’ll give him 10 if I want to. He brings so much to this team and last night he scored a peach of a goal. Cesc 9 A bit quiet, nothing exciting came off for him but he’s our captain and he loves playing for Arsenal. Song 9 Wow, this guy has come on in leaps and bounds he was everywhere and clearly has seriously silky skills. Nasri 8 Must have been frustrating for him as all the play was going up the other wing so he had to seek out the ball. Van Persie 9 I wonder if he was really fit, a bit lethargic in the first half but worked hard for the team. Took his penalty beautifully and deserved a goal. Adebayor 8 Lazy, off-side aaaaarrrrrrggggghhhh and then scores a great goal, watch it again – his first touch was perfect. Subs Denilson, Diaby – could have scored and Nikki all had a run-out but the game was over by then. All in all a thoroughly enjoyable night of football and the Chavs to look forward to on Saturday. Why is it that it is always our players that are targeted by the Big two in Spain? You rarely hear of a Liverpool player randomly wanted by the Presidents elect of Real Madrid or Barcelona. The Ronaldo To Madrid story broke because Man U would not meet the new wage demands so the agent alerted Real. It is obvious from his body language he is off in the summer and Man U sorted a one year deal out so they could let Ferguson save face. Man U are said to be lining up Ribery as his replacement, as JonJon said it would be better if he went to the Spanish giants then their thirst for a big name each can be satisfied and leave our top guns alone. Do they pick on us because we have the best players for them and it suits their style of football? In the past most of the players that have left Arsenal to play on foreign shores have not really reached the heights that they did with us. Brady, Van Bronkhurst, Silviniho perhaps are the ones that are exceptions to the rule and recently Henry has recaptured some of his old form. Until we win the European Cup we are seen as easy pickings. If we win the European Cup our profile as a big club is raised to the top. we are no longer that feeder club that quality players use as a stepping stone. We need to be up their with Madrid, Milan, Barcelona and even Man U when a player looks around for a new club he needs to know he would be taking a backwards step or at worst a sideways one. A small concern though is Mr Wenger obe, will he feel he has achieved all he can at arsenal or can he keep the hunger and desire going to make our club the biggest and best in the world?. Rico has given us her views on tonight’s game. Tonight sees a rematch of the 2006 Champions League Semi final, and my question is will the outcome be the same?.. Villarreal a few short weeks later went on to shock us all, they stole away one of our prize possessions for free. Arsene made him feel unwanted and he felt let down when he was substituted in the final in Paris in front of his whole family. How I have missed those little legs with ’10 to 2’ feet at the end of them, racing down the left, unleashing a fierce shot on goal, the inch perfect pass to Freddie or Thierry and another goal for us to celebrate… Oh happy days they were. But life has moved on, he now plays for tonight’s challengers, three years older and hopefully three years slower, and I really can’t see him getting the better of Sagna – so I am not going to worry about Sir Bobby tonight. The ground itself is a little like how ours used to be, their stadium only holds 25,000 fans, and it seems to attract some dreadful defenders to it, which brings me on to another old boy of ours, Cygan. He will be playing against his old club who, unlike with Bobby, I would have given him away, and thrown Eboue into the deal. With Theo he will have his hands full and will have to try very very hard not to make himself look too silly with his lack of pace – and that is not me being cruel, its real, Cygan was poor when he was with us, he must be worse now.. The only other player I know about is Senna – 33 years old and some still rave about him. For me Paddy was always better than him, and when he got older and played against our midfield which included Cesc, we all know what happened, so I am not too concerned about him either. If Song and Cesc play in the centre of the midfield, he will get little joy. I am sure there is truly no reason to fear our opposition – respect, yes, but not fear. Tonight is about going to Spain, getting two away goals, and all but killing the tie off. The defence needs to be sharp and on the ball. Dont give them an inch, and I dont think they will. If we defend as well as we have done, we will come away with a clean sheet. My(Rico’s) team for tonight would be.